There is a rumor that the trees come alive on All Hallow’s eve (Halloween) and cause a great deal of mischief in their neighborhoods, including snatching candy away from unsuspecting trick-or-treaters. Aaron Piskin, of Pierson, sent us this photo he took of a tree, located on Pine Lake Avenue near 17 Mile, practicing its scary face for Halloween. 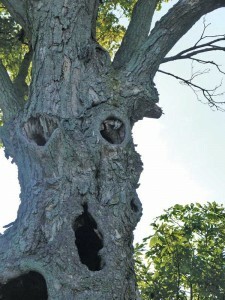 If you see a tree like this one on Halloween, don’t try to climb it and don’t play dead. Instead, run as fast as you can in the other direction and don’t look back!